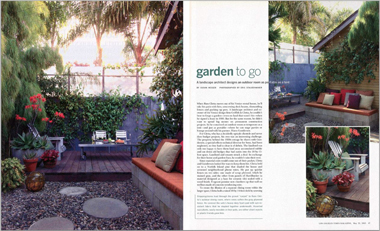 Garden to Go: a landscape architect designs an outdoor room as portable as a tent. Article: When Russ Cletta moves out of his Venice rental house, he'll take his patio with him, unscrewing deck beams, dismantling fences and packing up pots. A landscape architect and co-owner of the Venice design firm Griffith & Cletta, he couldn't bear to forgo a garden-even on land that wasn't his-when he signed a lease in 1999. But for the same reason, he didn't want to spend big money on a permanent construction projects. So he conceived an outdoor room as temporary as a tent-and just as portable-where he can stage parties or lounge around with his partner, Harry Gundersen. For Cletta, who has decidedly upscale clientele and never does budget projects, his own was an interesting challenge. The property behind the 1920s cottage he shares with Gunderson, a special-effects technical director for Sony, had been neglected, so they had to clear it of debris. The landlord was only happy to have them haul away accumulated rubble and cut down old hedges that had eaten into the 30-by-15-foot space. Landlord and tenants struck a deal: In exchange for their home and garden fixes, he wouldn't raise their rent. Since material costs would come out of their pocket, Cletta and Gunderson looked for ways to keep them low. Cletta held on to a Norfolk Island pine that shaded the house and screened neighborhood phone wires. He put up quickie fences on two sides: one made of scrap plywood, which he stained gray, and the other from panels of Hardibacker (a material designed as a base for ceramic tile) sealed with a wood finish. Fragrant jasmine now clambers up that wall on trellises made of concrete reinforcing wire. To create the illusion of a separate dining room within the larger space, Cletta built a raised 10-by-14-foot deck by screwing wood planks onto support beams that rest atop precast concrete pavers. The weight of the easy-to-dismantle structure holds it down, and Cletta furnished it for next to nothing. His steel table was free, salvaged from a cafeteria. He shortened its legs and put it on wheels, then paired it with two $15 aluminum café chairs and a flea-market Adirondack chair that he spray-painted silver. As a rugged alternative to lawn, he laid a "carpet" of ¾-inch gravel ($30), complete with round poured them in place to get the sizes he wanted. For garden naps and entertaining, he added a cushions wrapped in sun-resistant fabric ($234, including cushions). His potted plants were mostly friends' throwaways, and his one big splurge was a precast "fire bowl" that required an $800 gas line. It will stay put if he pulls up stakes. But it's a party magnet, Cletta says, especially on chilly coastal summer nights. And almost everything else-sofa, walls, floor, guests-is sure to wind up in his next garden.